In our search for understanding of the perennial predicament in our homeland, a visit to the history of how our past presidents led or, more aptly, ruled provides us some historical insights; that is, allows us to discern patterns and trends that we of subsequent generations can identify as permeating our present so-called national leadership. The late I.P. Soliongco wrote a series of articles about our post-WW2 presidents from the years 1946 to 1971, the year of his death. His articles though dated are so alive and resonate in the thinking Filipino mind, given that his critical analyses and observations are so relevant, 60+ years ago today. In below article, I. P. Soliongco provides us a critical analysis of both the Magsaysay and Garcia presidencies. As stated by Prof Constantino in his Introduction: "...He (Soliongco) described the colonial mentality and policies of Roxas and Magsaysay were the most pro-American of Filipino leaders... The Garcia administration was the first to try to restrain the expansion of foreign interests in the economic sphere." President Magsaysay as one who lacks a deep appreciation of what Filipino nationalism is all about and who do not understand the military (tunnel) mind. After my reading, I realize Magsaysay is our "poster boy" for using military men in civilian/government offices, it was not Pres. Marcos. This pattern has expanded in each subsequent presidents, even having one as President - Fidel Ramos. I remember during the Marcos Regime, one of my older cousins, a PMA graduate told me about the folly of having military men in civilian offices. Conversely, President Garcia demonstrated his economic nationalism, understanding of neocolonialism even before this term became common knowledge. Note Garcia's independence of mind, that is, free from the influences of foreigners (American, Chinese), of the Catholic Church/hierarchy and the military establishment. The statement that President Magsaysay was supported officially by the Americans in the electoral campaign of 1953 is not something which can be proved as if it were a geometric proposition. But those who recall those days will not easily forget that from the time Mr. Magsaysay was appointed Secretary of National Defense --the recommendation for his appointment was hand-carried to president Quirino by Ambassador Myron Cowen-- to the day he met with that tragedy, he was literally under the guidance, if not under the custody, of then Col.Edward Lansdale. As Secretary of National Defense, Mr. Magsaysay took advice from the Colonel, and the Colonel was by his side in the Camp Murphy office almost everyday. It was no secret at the time that the campaign against the Huks were discussed by the two, and even in the harassment of newspapermen, Lansdale could justly be suspected of having a hand. What would make the participation of the Americans hard to believe was the tacit consent given to that participation by such advocates of nationalism such as Recto, Laurel and Tanada. But one must remember that in 1953, the deterioration of the Liberal Administration was complete. Corruption was everywhere, and everywhere there was fear that the horrible farce and fraudulence of the 1949 elections would be repeated with vast improvement in technique and virulence. And in 1953, the only contender with President Quirino for the loyalty of the army was the Secretary of National Defense. The Nacionalistas argued that, with the army neutralized, there was no chance for the incumbent to be re-elected. And to them, his re-election by foul means would be a prelude to violence. Moreover, let us admit here that the nationalist elements among the Nacionalistas were as desperate as the American revolutionaries at the time Washington was about to cross the Delaware. They would have welcomed any aid from any quarter, and the Americans were ready with their aid --and with Ramon Magsaysay. The decision to accept American intervention was made, as everybody knows, in the presence of the highest officials of the American Embassy. The intervention was accompanied by goodwill and some unofficial cash --and Magsaysay won by the largest majority garnered ever in the short history of the Republic. On the day President Quirino conceded, Magsaysay was a house guest of Mr. J. Antonio Araneta. From there he went directly to Malate Church where a Te Deum was sung. Later, he went straight to the grounds of the American Embassy where Ambassador Raymond Spruance, Minister William de Lacey, the ubiquitous Lansdale, and other American officials were lined up to meet him. The President-elect jumped from the Araneta cadillac straight into the arms of the Americans. He was taken to the yacht of the American embassy where he spent the whole day and night. Mr. Araneta, who was also invited, declined and returned home. Two days later, the President-elect held a luncheon in the white house of Mr. Senen Gabaldon in the old Santa Mesa. The house had served as one of the many campaign headquarters, and he thought it would be nice to have some talk with his American advisers and with some of those Filipinos who had supported him. Present were Senator-elect Emmanuel Pelaez, J.V.Cruz, Col. Lansdale, Capt. Buhanan (I am not sure of the spelling of his name but I remember him distinctly) and another American. In the beginning, the talk was more or less general, but later, the president-elect announced to the person seated next to him his decision to appoint J.V.Cruz as his Press Secretary. Towards the end of the meal, the need for a place of rest for Magsaysay before his inauguration was raised , and quick as a gun, Col. Lansdale suggested a place he knew near Saigon which would be ideal for the purpose. The Filipinos, led by Senator-elect Pelaez objected, and Magsaysay to his credit understood. It is, of course, difficult to show how the closeness of the Americans to Magsaysay could prove official American assistance during the campaign. But it is not difficult to show that such a closeness made Magsaysay, probably next to Manuel Roxas, the most pro-American President the Filipinos ever had. There is no complaint about the well-known habit of President Magsaysay of going to the remote fastnesses to meet the people, acquaint himself with their problems and, in his own unorthodox way, attempt to improve their lot in life. We imagine it is his duty to do so; it is even his obligation to compel his subordinates to emulate his example. But we have every right to complain if Pres. Magsaysay carrying the spirit of democracy to absurdity, goes out of his way to meet every American official who happens to have anything to do with Philippine-American relations. There was a time when he could do so with impunity. That was when he was a captain of the guerrillas. That was when he was Secretary of National Defence. Then he could safely discuss the most serious matters even with an American colonel. But now he is the president of the republic, elected by the largest majority in the nation’s political history. As such, he has to observe certain amenities which, at times, he might find irksome. But he can’t help it. The dignity of his office demands it and the dignity of his people will suffer if he ignores those amenities. He will never be criticized, we repeat, as long as he deals directly with Filipinos, or for that matter, with private American citizens. But it is entirely a different proposition if he deals with American officials. he has absolutely no business dealing with them. He has enough number of subordinates whom he can assign to discuss with American military or embassy officials. But given the way things are at present, even an American lieutenant or a minor embassy employee feels that he has a lien on the President’s time. The result of this unhappy situation is disastrous to the prestige of the Filipinos. And it is beginning to dawn upon them that their government is an extension of the American government and their President nothing but an American-appointed governor-general. It is only to be expected that Pres. Magsaysay should sniff at nationalism, considering that he does not have the faintest idea of what it means. It is also to be expected that J.V.Cruz should be condescending in his attitude toward nationalism because of his belief that, to be in the good graces of his master, he must needs to be vicious. We venture the opinion, however, that five years from now, the so-called nationalism which today is the subject of Malacanang’s derision will be a full-blown thing, and Pres. Magsaysay and his press secretary,assuming that they will still prefer the Star-Spangled Banner to the Philippine national anthem, will have found they made a mistake. It is perfectly understandable that Pres. Magsaysay and his press secretary should want to take credit for what they regard as a major diplomatic victory. We expect them to do so. But in doing so it is not necessary for them to be so smug about a feeling and a movement they don’t understand and for which they, like the rest of the foreigners in the country, cannot possibly have the slightest sympathy. But what are President Magsaysay and J.V. Cruz crowing about? They are crowing over the fact that they have succeeded in persuading the United States to issue a waiver of her claims of ownership of the pre-war bases. In other words, they admit, by implication, that the U.S. was justified in her claims. Under the circumstances, it is safe to presume that the U.S. waived her claims out of regards for the wishes of Mr. Magsaysay and Mr., Cruz. But if President Magsaysay had really desired to assert Philippine sovereignty of pre-war American bases, all he needed to do was reject the American claim. There is such a claim and it can still be rejected. It is unfortunate that the speaker did not take the trouble of explaining the nature of the late President’s nationalistic machinery. As it is, the only machinery of president Magsaysay’s we recall was headed by an American by the name of Colonel Edward Lansdale, a man whose understanding of, and sympathy for, Filipino nationalism are about as much as Raul Manglapus’ understanding of, and sympathy for, Protestantism. It was this machinery of President Magsaysay’s which sold him to the people and which later formed the nucleus of the Magsaysay for President Movement (MPM). Now, it is not on the record that this machinery ever identified itself with the seething nationalist movement. As a matter of fact, it was this machinery which sought to retard the movement by deflecting the people’s mind from it to something innocuous like “positive” nationalism. It is a favorite argument of the Grand Alliance that Pres. Magsaysay was himself a great nationalist. To prove their rather far-fetched claim, they point to the modification of the Bell Trade Act into the Laurel-Langley Agreement, the panel discussions on the bases issue and the approval of the nationalization of the Retail Trade Act. The intellectual dishonesty which pervades these so-called proofs should be obvious to anyone who is privy to the facts. In the first place, Pres. Magsaysay was so brazenly pro-American that he could not conceive of any form of Philippine nationalism which was not sanctioned by his American advisers and friends. In the second place, all the nationalistic laws which were passed during his administration and all the negotiations which were conducted during his term were originated by Nacionalistas, not by him. True, he signed the laws and agreed to the holding of negotiations. But he did so not because he was a nationalist but because he knew that in his early years as president he could not reverse the honored policies of the party to which he was merely a newcomer. The Nacionalistas, for instance, had been agitating for a revision of the Bases Agreement long before they invited Mr. Magsaysay to be their candidate. Senator Recto delivered speeches everywhere to bring home to the people the inequalities of the Agreement. He urged its early revision, and it was he, alone by himself, who refuted the American claim that the United States owned the lands occupied by her bases in this country. The revision of the Bell Trade Act had been a basic Nacionalista aim even before Mr. Magsaysay thought of changing his party affiliation. It was the then Vice President Garcia who headed the committee which made a thorough study of the defects of the Act. And if Mr. Garcia got the post it was not on the initiative of President Magsaysay but on the insistence of the directors of the Nacionalista Party. The Cabangbang bill, which was approved by the House the other day, would ban army officers from appointments to civilian positions in the government. This is a belated attempt to remedy a situation which arose during the brief administration of the late President Magsaysay. During that time, the military organization was almost completely depleted of its ranking officers because of the policy pursued by the late President. He appointed them to key positions in the government and to directorships in the various government corporations. His closest advisers were generals and colonels. These were the people who helped him chart the course of the state, and in many instances it was their attitude and temper which colored his acts. The body politic assumed such a form as to create doubt as to whether the government was in the hands of the representatives of the people or in the hands of a military junta. The principle of the supremacy of civil over military authority was honored with nothing more than lip service, and military brass began to assume an attitude of supercilious arrogance and to consider themselves called upon to carve order out of chaos. It is no wonder that even after the tragic death of their patron, the military persisted in this attitude. Some of them, unable to accept the reality of the transfer of power from President Magsaysay to President Garcia, pursued their thoughts to their logical conclusions and developed a messianic complex. Theirs, they convinced themselves, was the moral obligation to save the country from the rule of politicians. In a way, President Magsaysay could not entirely be blamed for his abject dependence upon army officers. his intellectual limitations made him an easy prey to the seductive allure of the seeming discipline and deceptively precise thinking of the military. He never understood the nature of the democratic process and his sectarian view, the professional politicians, who are used to answering back and with whom he could not carry a sustained argument, were a necessary evil. He therefore preferred the company of military officers who were compelled by their curious sense of discipline to say yes to their master but who took out of their frustration on their hapless subordinates - and on the people. Magsaysay’s accomplishment is, if we may be permitted to be blunt about it, nothing more nor less than an improved technique of politicking, of running a propaganda machine, and of mesmerizing the amorphous masses into reacting to presidential decisions and utterances into a well-conducted chorus. That the Magsaysay administration can not be credited with an accomplishment other than this is indeed tragic. For all of the administrations we have had, the Magsaysay administration had the popular support which, properly used, could have enabled President Magsaysay to be different from his predecessors, to be the spearhead of a social and economic renascence. For from the point of view of chronology, President Magsaysay represented a departure from the past. He was strictly a product of post-war years, tied by no umbilical cord to the political tradition of a past and better forgotten era. NOTE: In 1953, Lansdale propelled Magsaysay to the presidency in an American-style campaign. Devising the slogan "Magsaysay Is My Guy," he manipulated the U.S. press into using labels like the "Eisenhower of the Pacific." Magsaysay won a record vote, earning Lansdale the moniker of "Col. Landslide." One tremendous fact which should not be forgotten about President Garcia’s victory is that neither the church nor the Americans had anything to do with it. Indeed, it might even be said that the church and the Americans had their respective preferences. Their preferences, to be sure, were unofficial, but subtle measures were taken during the campaign to convey to the electorate notion that this or that candidate had the backing of the Americans or enjoyed a certain amount of ecclesiastical sympathy. To our mind, this is a fact of overwhelming significance, for then, unlike, say, President Magsaysay, he need not be burdened with the thought that, in solving the problems of the nation in the proper way, he might be committing an affront to American or ecclesiastical sensibilities. Certainly, when he finally settled down to single out the key men who will help him run the government, he need not, like his predecessor, hold their recommendations and connections above their qualifications and integrity. Thus, he is under no compulsion to retain the services, say, of Ambassador Carlos P. Romulo merely because this gentleman is known the world as an American agent. Nor is the President under any compulsion to suggest the election of a man to the presidency of the University of the Philippines whose outstanding merit is that he is backed up by the church or by its numerous lay organizations. There is no advocacy here of the appointment of men in high positions in the government or grounds of their anti-Americanism. But it is humbly suggested that qualified men should not be barred from the government service because of their independent views or because of their refusal to be votaries of conformity. President Garcia could have not chosen a better occasion to clarify his views on economic nationalism than the dinner at the Manila Overseas Press Club the other night. His audience was made up of Filipinos and foreigners whose professions and whose economic predilections made it necessary for them to take in and ponder his every word. How they received his views hardly matters. What matters is that they know exactly where the present administration stands on the question of economic nationalism. They know, for instance, that the implementation of economic nationalism is subject to the international obligations of the Philippines as embodied in the Parity Amendment and the Laurel-Langley Agreement. But they know too - for the President told them clearly - that those obligations will cease to be binding in 1974. Above all, they know the President, unlike his predecessors, does not harbour dangerous illusions about the nature of Philippine independence. The two important truths in these sentences - the truths that as long as aliens control the national economy, “ we shall remain in many ways a colonial country” and that unless Filipinos gain control of that economy, there will always be a “threat to the stability of our social order” - must be fully understood by both Filipinos and foreigners before they can appreciate the compulsions behind economic nationalism. As scroungers, they have no choice but adopt the ethics and sense of values as scroungers. About the most happy aspect of the present administration is the gentle but firm refusal of President Garcia to be impressed by either newspapermen or the military. It was only the other day, let it be remembered, that these two groups of men were held in such high esteem that there were not a single government directorship which was not open to them. Perhaps more in the spirit of cooperation than in the spirit of self help, they honored the government by accepting the choicest appointments it could offer. Thus the military and the newspapermen became government fixtures. As a matter of fact, one could not help gathering the impression that the government would cease to function without the steadying hands of journalists and soldiers. There has been advanced an array of reasons for the ascendancy of newspapermen and the military during the regime of President Magsaysay. One is that the newspapermen were mainly responsible for selling him to the people. Another is that the military was the only group with whom Mr. Magsaysay had been intimately associated during his political career. The triumphant conclusion is that he had to honor the first because he wanted to show his gratitude and he had draw men from the second because his acquaintance with civilians were severely limited. Undoubtedly there were some members of the military who have comforted themselves rather well in civilian pursuits. But we have to hear of an outstanding achievement that can be traced to any newspaperman in the government service. He had, we repeat, to be grateful to them. And he was - to the point of selling them. Now, President Garcia seems to be a man of different orientation. He grew up among civilians and it is in them that he has sublime faith. It is possible that he respects soldiers and newspapermen, but there is considerable evidence to show that his respect for them is not so much as to make him place vital government functions in their hands. Indeed, there is every reason to believe that he prefers newspapermen to stick to their job of reporting and commenting on the news and the soldiers to stay at their jobs of defending the country and maintaining peace and order. You are on the right track, Filipinos have a unique set of problems. I am not sure that looking at historical presidents will do anybody any good. The problem is here and now. I will, however, concede that looking back can serve a minor function but merely to show what went wrong and when, it does not the slightest thing to remedying any present problems. Contrasting two presidents is a good academic exercise but does not change the place where the Philippines has now come to rest. Filipinos have not yet identified their real enemy (after themselves that is). The US is not their friend. Then again we can formulate some solutions but the chances of any of them being implemented are zero. Democracy is rapidly failing all over the world. I think you have a scientific inclination/mind and so appreciate the value of the past, whether we are dealing with problems in the natural or physical sciences, and even the social sciences. For us natives, it is useful to know, understand and connect the dots of the past to the present. True, overall we native Filipinos have not identified ourselves and the continuing 100+ years of American (economic and cultural dominance (colonialism and neocolonialism) as two of the major obstacles to the attainment of the common good. Other major obstacles being our medieval variety of Christianity, our distorted family values, the few remaining Spanish mestizo and native oligarchs, the Chinese taipans who control our retail economy -all who deep down do not really identify with the native Filipino. Starting with Fidel Ramos regime, the WTO agreements that opened our weak state to the mush stronger countries further complicate these historical realities; with the reversal of the country -then with a self-sufficient agriculture and nascent industrial base- into an essentially trading centers/posts run by old and new foreigners who remit all their profits to their home countries (as existed during most of the Spanish and American colonization); and intensify the adverse effects to our national economy and leave the native majority struggling and hustling endlessly for daily survival. I agree (republican) democracy in the USA and others are deteriorating as they become controlled by a few giant corporations. And of course in my homeland democracy exists only in form/structure and manipulated by both native and foreign powers-that-be; but not in any reality working for the ordinary natives. 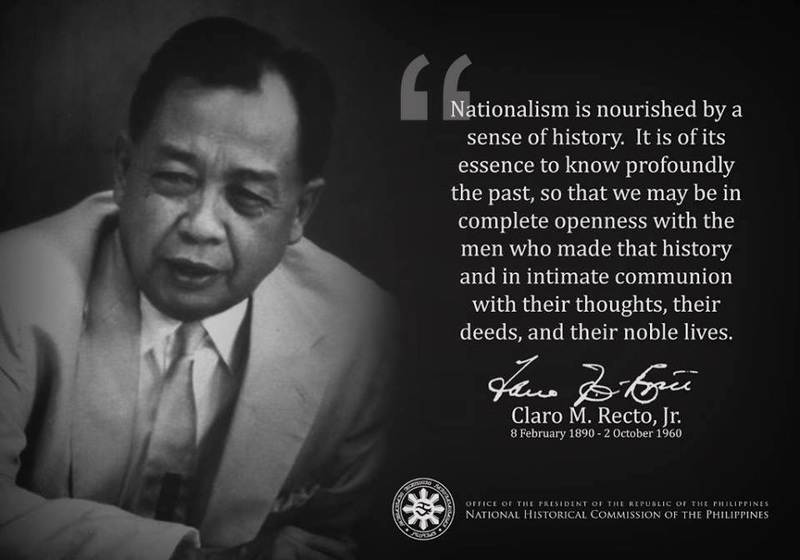 All these problems boil down, for the most part, on the essential illiteracy of the native Filipino majority and the ignorance of true Philippine history among them and including so-called educated/middle class, as the educational system lacks and does not foster Filipino nationalism. As you may know, most nations, developed. the Asian Tigers and other lately rapidly developing ones, have become what they are because of their corresponding nationalisms. The developed ones to ultra-nationalism.i.e. imperialism or colonialism. Given all of the above, I tend to agree with you regarding solutions. I say solutions have been presented in the past by concerned Filipino nationalists, reformers, and even by a few good, progressive Americans; but the successive regimes, their oligarchic and resident-foreign (American and official US-policy, Chinese) supporters did all to stop/subvert any fundamental reform. To reiterate, all these obstacles, both internal and external, exist and dominate us natives because of our massive illiteracy and the ignorance of an "educated" native middle class -this latter who seem to also not identify and do not know the need/want to inform themselves and the masses. All of which lead to lack of nationalism, or lack of national unity. Thus, we native Filipinos remain essentially as individuals in the islands (or anywhere as a matter of fact), and do not form or belong together as a nation -as Jose Rizal alluded to over 115 years ago. So sadly and maddeningly, we are where we are today and to further deterioration.